Placed in core of Santos commercial center, Bolsa Oficial de Café not always occupied the building which became famous. 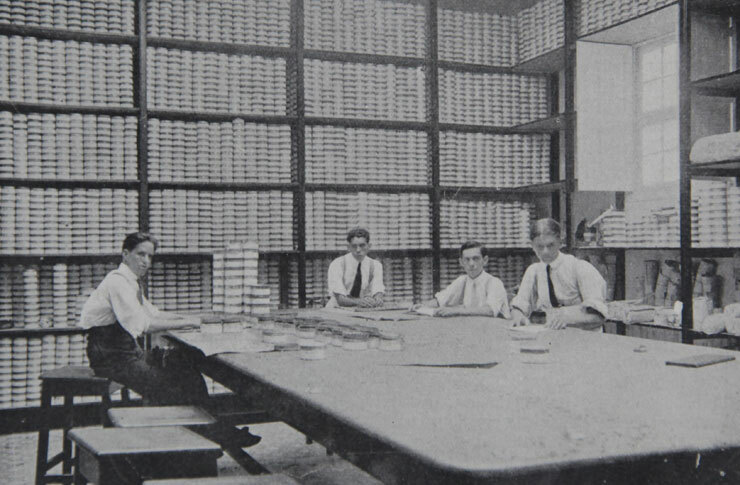 Created by federal decree, Bolsa started working in 1917 as a small partition in a building placed in XV de Novembro Street with Rua do Comercio. When you see that pictures, you notice that building didn’t hold luxurious and grandiosity of the building we knew today, opened in 1922. 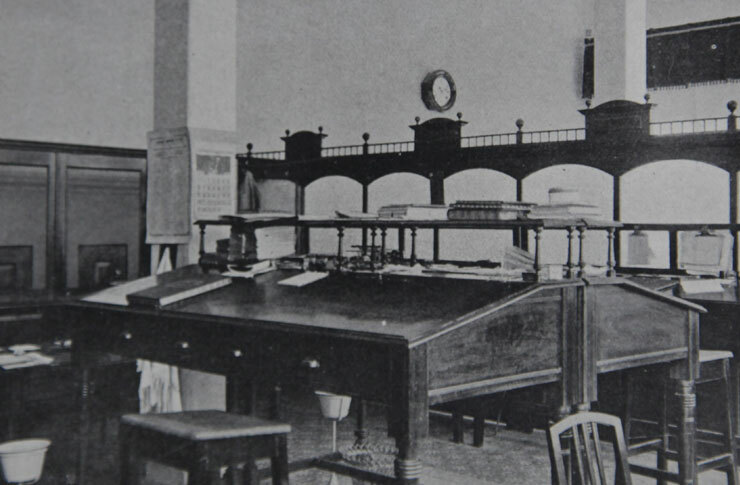 Its rooms were very functional and they were a bit different from internal environment of an office of a commissioning or exporting company of that period. Bolsa functions had already been developed in space where it was located: only own headquarters for its working was required. But, so, why so much opulence in building project? Two hypothesis are practicable to understand history context of building of Palacio da Bolsa de Café, which somewhat they complete each other. One of hypotheses that Sao Paulo coffee elite had tried to establish as a nation builder with other states, like Rio de Janeiro, Minas Gerais and Bahia. However, Sao Paulo was a new richness state. 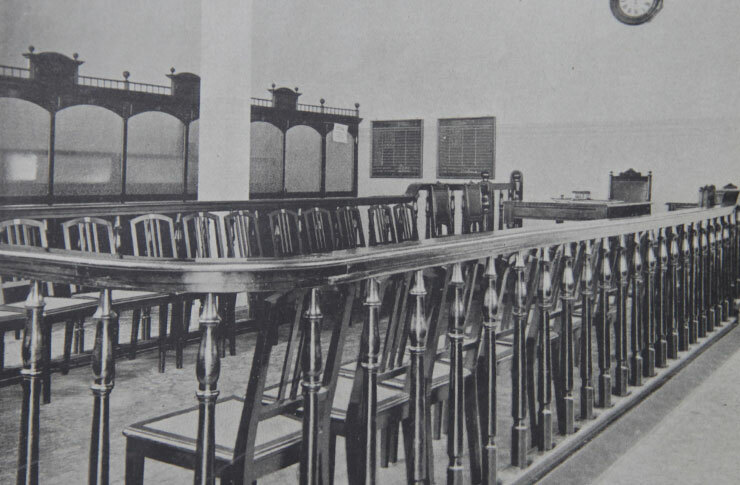 From second half of 19th century, when coffee started to be produced in Campinas and Itu regions, which started forming a bourgeoisie with aspiration for its history. To do so, Bandeirante was created as a ‘hero’, legitimizing Sao Paulo participation in building and consolidation of national territory. This passage show that richness of Sao Paulo State, concretized by social group who complained about being a lever of Brazilian progress, was demonstrated in celebration that certifies and marks its power in Brazilian history with a monument: Bolsa Oficial de Café. The second hypothesis was to celebrate 100 years of Independence of Brazil in 1922. At all country, programing and great pieces, which were part of event, were planned with two, three up to six years in advance. In Santos can’t be different. The richest exit door of Sao Paulo of that time, too much effort was placed so that date was dully marked as milestone in history. 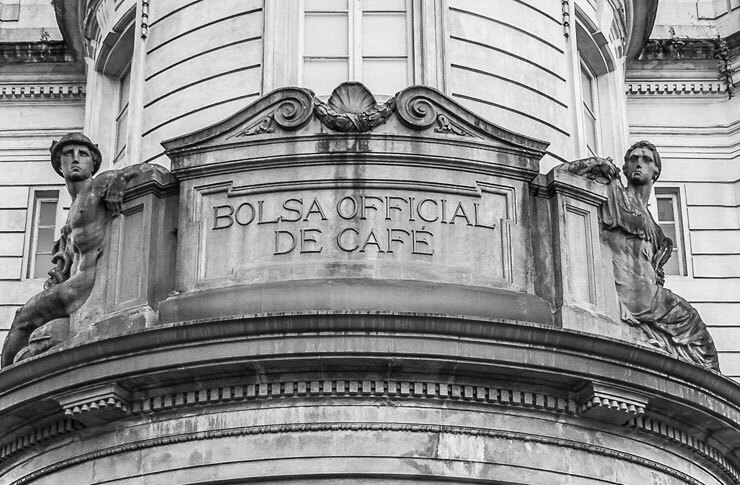 Palácio da Bolsa Oficial de Café, opened in 1922, had opulence and force of São Paulo coffee elite. Majestic and imposing public trading room – even more if compared to those used in previously occupied building -, had a set of paintings performed by painter Benedicto Calixto: the triptych with possible read scene of floral of Vila de Santos by Brás Cubas; idealization of Vila de Santos in 1822, according to artist studies based on photos and documents, and situation of city in 1922. In addition to the three paintings, this set counts with stained glass which also establishes relationship with three moments in Brazil History by signs and symbols of Brazilian and Greco-Roman mythology. This complex and dense set of information is combined with several other mason symbols, like six-pointed star in center of trading floor or choir and columns organization.